Top athletes and sportsmen from Spain praised Rafael Nadal's seventh French Open title. 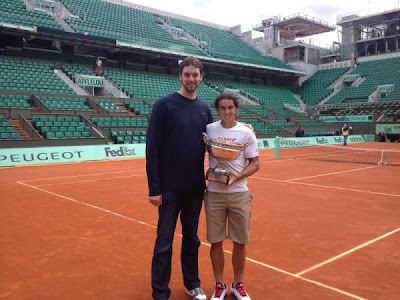 Spanish NBA player Paul Gasol, one of Rafa's best friends, was in Paris to show his support. On his Twitter, Gasol said he was "fortunate for having the opportunity to live an historic moment like this final". "Today has been a very special day! 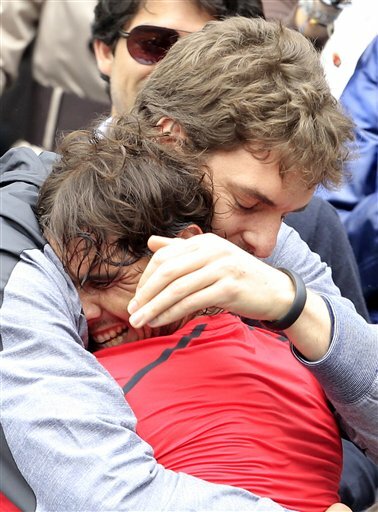 A great moment for our sport [Spain]! I hope you have been able to enjoy it! ", added the LA Lakers' player. Spanish cyclist Alberto Contador named Nadal's 7th Roland Garros as "impressive", while Formula One racing driver Fernando Alonso said he was "thrilled with Nadal's victory". Spain's national football team, which is competing in Euro 2012 in Poland, was getting updates from Paris, and according to newspaper Marca, players were also happy for Rafa. Some posted messages to Rafa on Twitter and Facebook. 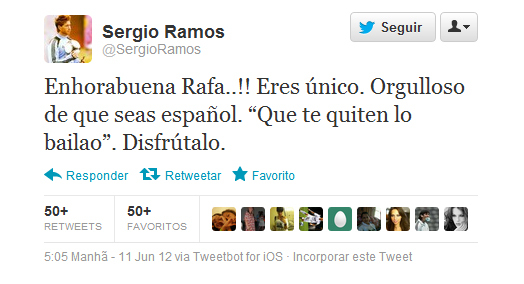 Real Madrid's Sergio Ramos: "You are the one and only. I'm proud you're Spanish". Spain Football Team Captain: "Another one, dear Rafa! Here in Gniewino (Euro2012), we are very happy"
Representatives from institutions such as Spain's High Commission for Sports and Madrid 2020 Olympic Bid stated that Nadal is "the pride of Spanish sports".